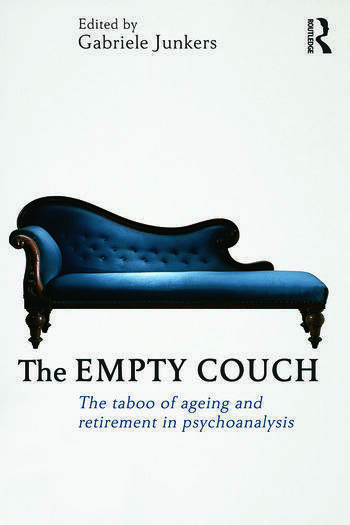 The Empty Couch is an introduction to the challenges and obstacles inherent in ageing as a psychoanalyst. It addresses the previously neglected issue of ill health, as well as the significance of ageing for psychoanalysts, exploring the analyst’s attitude towards getting older, impermanence and sense of time and space. Covering a wide range of topics Gabriele Junkers brings together expert contributors who discuss the problems of getting physically ill and how to conduct psychoanalysis as an ill therapist. Chapters also address the effects that ageing has on professional stamina, the grief inevitably caused by the losses endured in later life and inquires into the role that institutions (the relevant psychoanalytic institutes or societies) can play in this context. Setting out to encourage discussion on this vital topic, The Empty Couch brings this neglected area into sharp focus. It will be of interest to psychoanalysts, psychotherapists, counsellors, gerontologists and trainees in the psychoanalytic and psychotherapy worlds. Civitarese and Ferro, Foreword. Junkers, Preface. Ferro and Civatrese, Prologue. Part I: Growing Older as Psychoanalysts. Junkers, The Ageing Psychoanalyst: Thoughts on Preparing For a Life After the Couch. Quinodoz, Does and Elderly Psychoanalyst Have a Role to Fill? Junkers, Perhaps Later…Transience and Its Meaning For the Analysts. Fredrik Thaulow, Growing Older as an Analyst: Problems of Ethics and Practice Based on Personal Experience. Denis, Psychoanalyst: A Profession for an Immortal? Teising, Narcissistic Challenges for Aging Analysts. References. Part II: Illness and Ending. Junkers, When the Body Speaks and the Psychoanalyst Falls Ill. Fajardo, Life-Threatening Illness in the Analyst. Traesdal, Analysis Lost and Regained. Carlyle, Life-Long Analysis? References. Part III: Institutional Parts of Ending. Junkers, Containing Psychoanalysis: The Analytic Institution. Klockars, Ageing in European Psychoanalytic Societies - Psychoanalytic Practice: Terminable or Interminable. Marino, What Candidates Say About Psychoanalytical Perspectives on Ageing. Laks Eizirik, Giving up and Important Role in Psychoanalytic Organisations. Kavka, Psychoanalyst Assistance Committees: Philosophy and Practicalities. Kay O’Neill, Now is the Time for Action – The Professional Will: An Ethical Responsibility of the Analyst and the Profession. Teresa Hooke, The Ageing Candidate: Will the Empty Couch Become an Empty Institute? References. Junkers, Epilogue. Gabriele Junkers, PhD, is a trained psychologist, psychoanalyst, training analyst and member of the German Psychoanalytic Association (DPV). She is a gerontologist with more than 30 years experience in training older adults and providing institutional counselling for mature people.